Sand and gravel have been mined from sites throughout New England and eastern Canada, leaving the landscape scarred. Similar scars are the result of other kinds of mining and landfills closing. These kinds of sites are barren, in need of new topsoil and sustainable vegetation. In the past, native topsoil was taken from farm fields or construction sites for use in re-vegetating these sites. But removing native topsoil from farms is environmentally damaging. It's better environmentally to use pulp & paper residuals, biosolids, and other organic residuals (wood waste, wood ash, composts, etc.). A gravel mining area restored for hay production, 2006, central MA. Fall 2017: Canadian Land Reclamation article. Download a copy. Before... Paper mill residuals are mixed with biosolids and sand in an engineered topsoil. After... The same site, the next year. 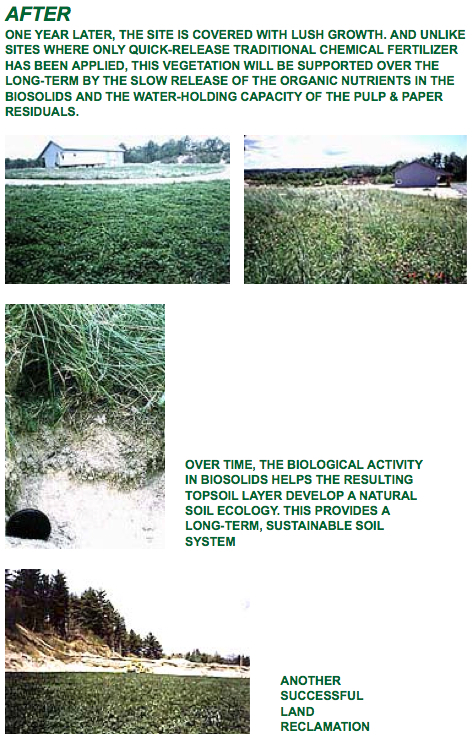 Research on the use of biosolids and other residuals for land reclamation has been ongoing since the 1970s. This video tells the story of soil restoration after devastating flooding in Alstead, NH in 2005.